Points : 8 out of 10. 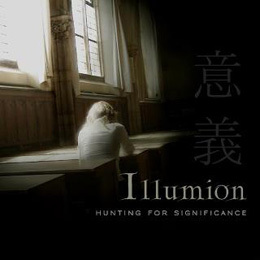 Illumion, a new Dutch outfit, started out as a band founded by conservatory laureate Eveline van Kampen on guitar, playing both original compositions as well as covers of Pain Of Salvation and Fates Warning. She worked with two members of the Dutch progressive fusion band S.O.T.E. : Peter H.Boer, on bass and keyboards and Emile Boellaard on drums and percussion. Boer also took care of the production of Illumion's debut album. As keyboardist at first John de Bruijn got enlisted, but later his duties were taken over by Eveline Simons. In the current line up however, Annemieke de Boer is the keyboardist. Inspired by artists like Pain of Salvation but also Gong, Kate Bush, Loreena McKennitt, Marillion (with Fish), Rush and Nightwish, Eveline came up with eleven original compositions, bringing together influences of gothic rock, prog, classical and jazz with superb musicianship. All tracks have a lot more to offer than the simple verse - chorus - verse format. Many, many changes in style, atmosphere, rhythm patterns and arrangements provide the listener with a constant tension, a curious feeling of what on earth will be coming next and this makes this album extremely interesting. The vocalist on Hunting For Significance is another laureate of the same conservatory (Alkmaar, Netherlands) Eveline graduated: Esther Ladiges, who lent her voice to artists like Ayreon, Entropy and Ixion. She's a graduate in jazz vocals and brings her own style in to Eveline's music. Esther is not the usual gothic powerhouse kind of singer but she uses her technique and emotion in her versatile voice surprisingly well, although I must admit I would have loved to hear this music with a singer like Floor Jansen. Esther often puts in several 'layers' of her vocal, adding to the bombastic character of this kind of music. Eveline plays a few solo's but allows both keyboards as well as bass and drums to excel as well. The rhythm section of S.O.T.E. does an outstanding job and the variation in sound of both keyboards and guitars is simply amazing. If one listens carefully, one can hear all influences mentioned on Illumion's website. The overall style could perhaps be best described as a jazzy version of Stream Of Passion, a slightly more heavy version of Magenta with touches of both the Flower Kings and Pain Of Salvation. The lyrics are written by Eveline inspired by authors like Edgar Allen Poe, Oscar Wilde and Charles Dickens. Although I had a hard time finding the instrument, Eveline plays the 'erhu' too, a two string instrument from China with a sound like a kind of violin. The contrasts between jazzy and heavy, complex and melodic, slightly aggressive and more mellow are blended just fine on this album. Illumion is a listening sensation for lovers of more complex but still accessible music, yet references to bands like Aesma Daeva and Stream Of Passion are never that far away. The title of this album has a meaning too: this illuminated group of musicians is indeed hunting to be significant for as many fans as possible and I think with a bit of luck and good promotion they could succeed achieving their goals. A welcome addition to the genre of 'female fronted metal' but a truly original one. Well done,Eveline!